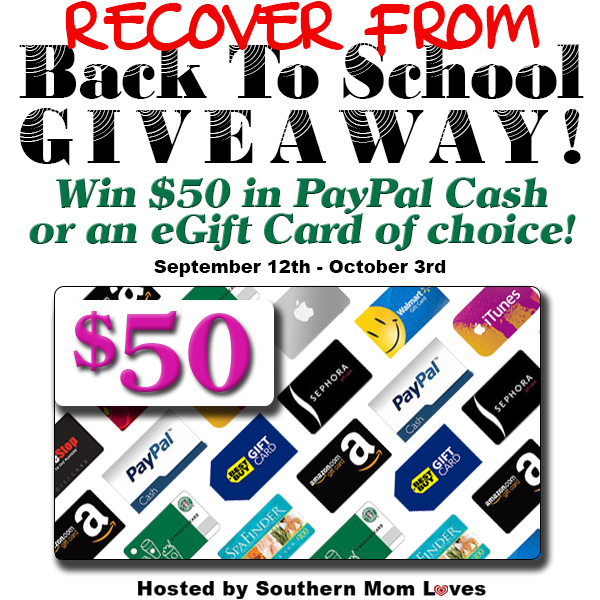 Mom Knows Best : $50 (Recover From) Back To School Giveaway! The kids are back in school and we moms are recovering from summer. You can win $50 to help you recover. Any store is up for grabs. If Holly can purchase an eGift card or code online and email it to you, you can choose that store, or you can choose cold, hard Paypal cash! It's totally up to you! She wants to help you recover and have a fun school year! Enter through the widget below and good luck! Disclaimer: Southern Mom Loves was not compensated for this post. No purchase is necessary to enter. One entrant per household, per IP address. All entries will be verified. Void where prohibited by law. Winner will be contacted by email; Please add southernmomloves@gmail.com to your whitelist. Southern Mom Loves will be responsible for prize delivery to the winner. This giveaway is in no way administered, sponsored, endorsed by, or associated with Facebook and/or Twitter, Google, Pinterest, or any other social media platform. I would choose the paypal cash to buy some groceries. I would like to have the prize via Paypal if I won. I would use it to buy books. I would choose Paypal Cash to buy a few things we need. I'd choose Paypal. I would save it for the holiday gifts that are coming up. I'd probably spend it at the local mall. I would choose the paypal cash to buy a stuffed animal I want on ebay for my nephew. I live in Maine. This is great!! We're all still recovering from back to school!! ha/ha I would love the Paypal prize! I would choose the Amazon card. I love Amazon, they have everything, so it makes my life easier. I would buy a new pair of winter boots. I am needing a new pair, and winter is quickly approaching. Nice winter boots are so expensive so this would be very helpful. I would choose Paypal and use it towards Christmas for the kiddos! I would choose the $50 paypal cash. It can be used so many places. I have a wishlist a mile long on Amazon so I would get an Amazon gift card. I'm saving for an instant camera, like the old Polaroid my grandma had! I would get PayPal simply because I can spend it anywhere. I have a PayPal Debit/Credit card. I would choose paypal cash so I could buy Christmas presents online. I would pick paypal so I could use it wherever I needed it. Thanks! I'd probably use it towards some new headphones - mine are a tad old already. And my cat likes to use them as a toy so..yeah. I would love an Amazon e-card. I would choose an Visa e-card so I can splurge a little bit on new Kat Von D makeup :)! Thanks for the opportunity and amazingly useful prize :)! Probably Paypal cash, however I'd be more than happy with either :) I'd probably use it towards groceries or for a book from Amazon. Thank you SO much for the chance! I would choose a amazon gift card or old navy as I need to purchase some warm clothes for this winter. I would choose paypal cash. I would use the money to buy my brand new grandbaby some gifts. I'd pick PayPal to help with paying bills. Thanks!